This case has mementos from soldiers and sailors who survived the armed conflicts of the war years. The national flag seems to be filled with names of fellow servicemen. 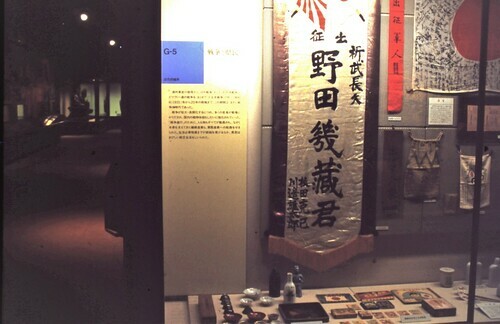 The long white strip with large kanji characters seems to be a home-made protection to be wrapped around one's middle as a kind of added (holy) protection from harm. June 1994 from 35 mm slides scanned in 12/2018.